April (eek!) is the fourth month of the year in the Gregorian calendar, the fifth in the early Julian calendar and the first month of the year to have 30 days… it is also the month we introduce you to feisty, French, firecracker Anthea Missy. Anthea is a French-born (voila! 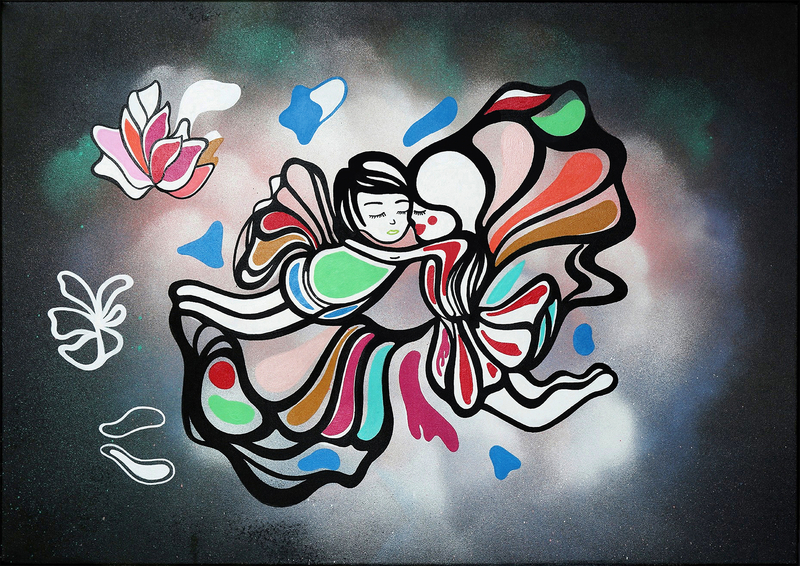 ), Belgium based, self-taught street artist who has left her mark on walls across the planet – including the (almost) unmarked walls of Singapore. 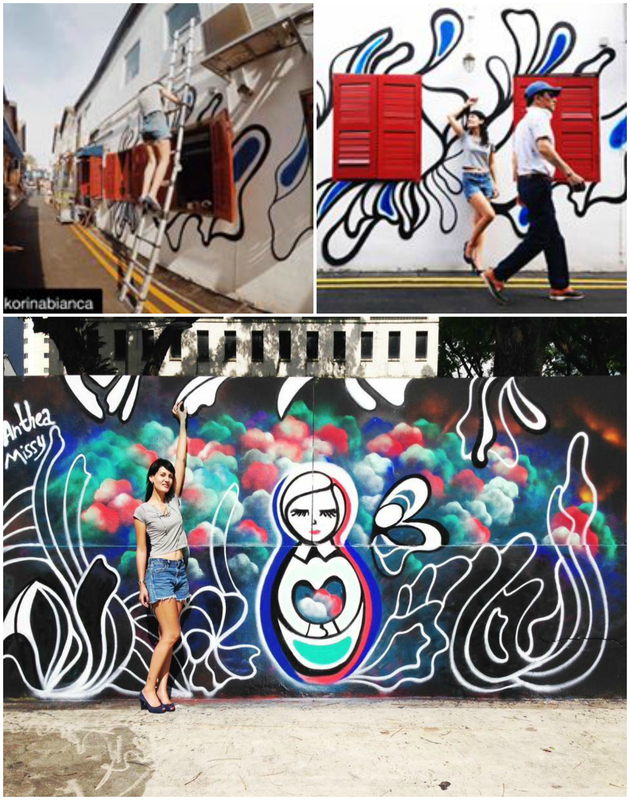 Top: Anthea getting busy on a wall in Singapore's Haji Lane. Below: Anthea's completed mural at Sultan Gate - Singapore. Due to the nature of street art, it is no longer with us and has crossed over to street art heaven. Thank Kodak for photos! 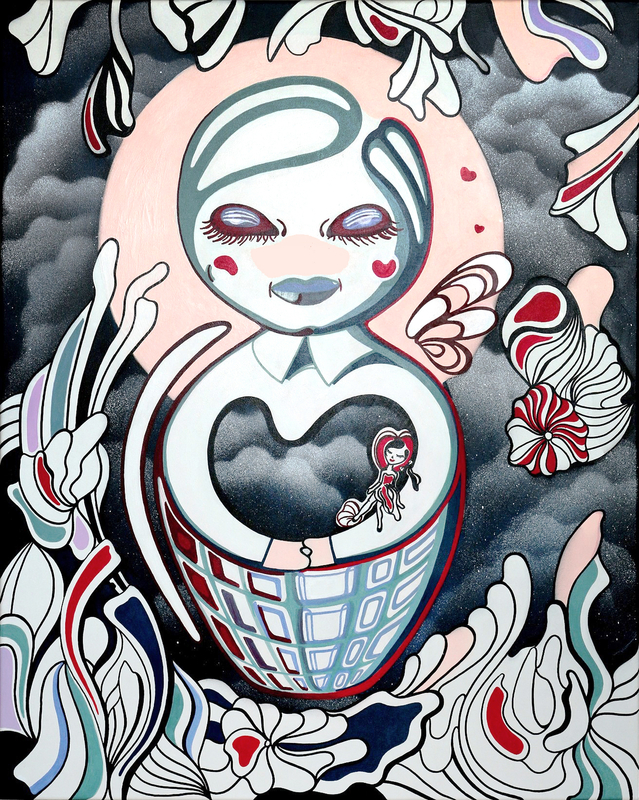 Presenting her first series “Love and Beyond”, this on-the-rise street art star has a style all her own and if you enjoy Kawaii (think Murakami and Hello Kitty for example) – in this case with a meaningful message - you’ll love her work. Self-taught artist Anthea Missy began her painting career in 2014 following the completion of a master’s degree in business administration. 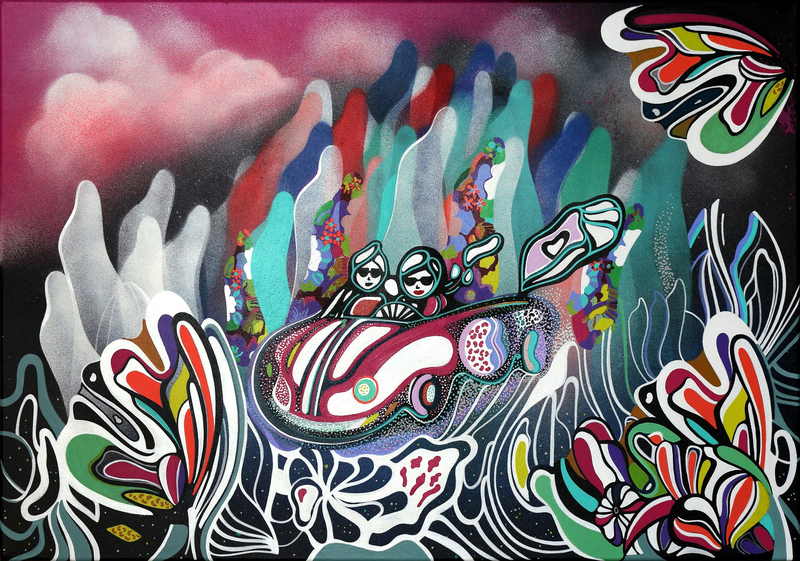 Combining her two passions – travelling and creating – Anthea’s art reflects her personal style and motto: “Come as you are”. Every artwork tells a story and every person she meets and place she travels has an impact on her pieces. She sets out to portray an atmosphere and feeling rather than express specific messages. 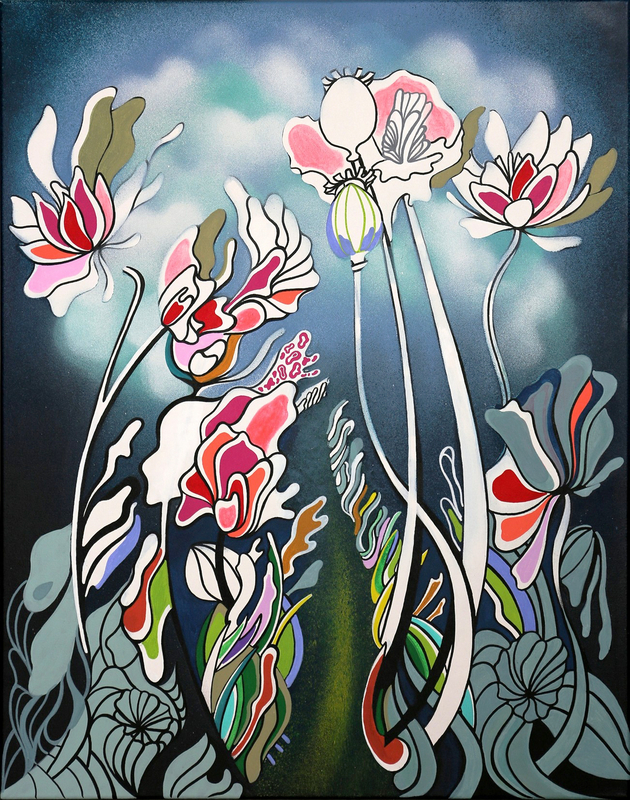 Anthea’s work is fluid and smooth embracing elongated lines and patterns, bringing a sense of whimsy to an otherwise urban landscape. Inspired by the Japanese rules of art ie keep things simple – Anthea’s works are minimalist. A basic background of black or white comes to life with bold colours such as red, magnetic blue or turquoise. 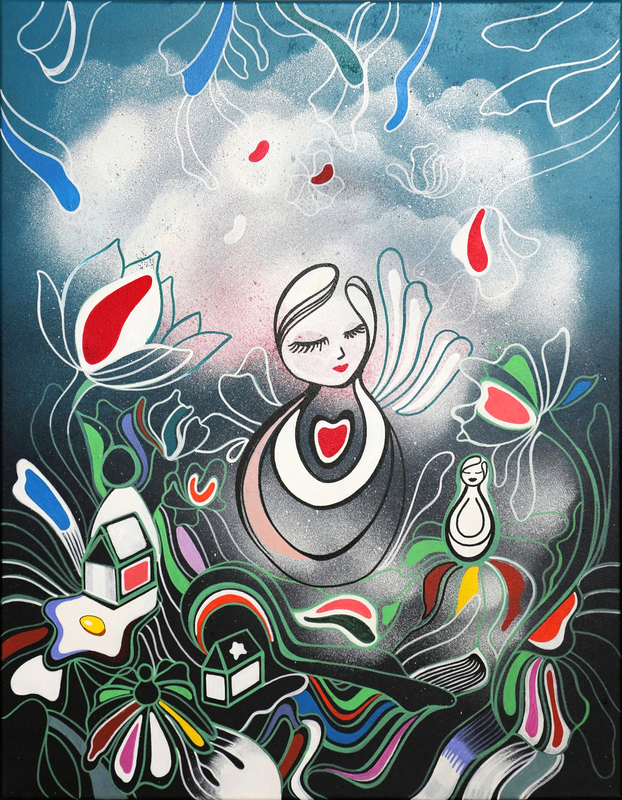 In their more complex appearance, her organic compositions convey a strong, ethereal and mystical atmosphere with a dreamy figurative edge. 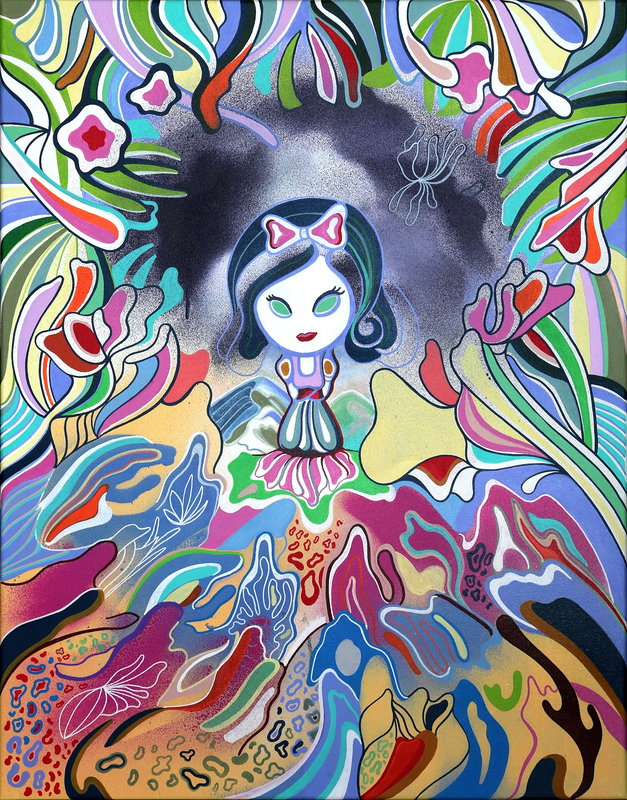 Emphasis is placed on the Kawaii touch (the quality of cuteness in the context of Japanese culture) in Anthea’s works. 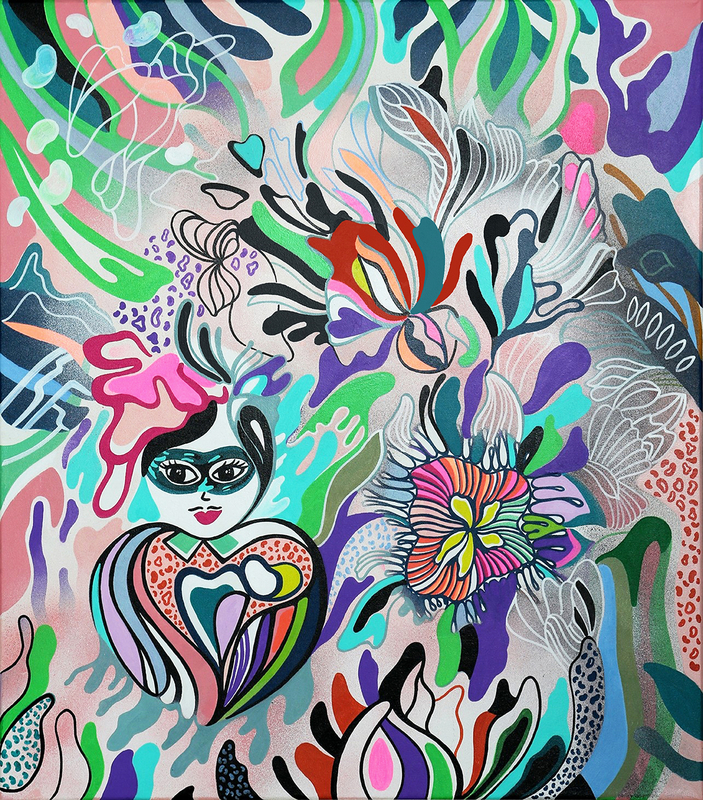 The apparent happiness and positivity of her innocent characters are a blend of motion and femininity. Influenced by community engagement and numerous personal artistic endeavours, Anthea shares her art where she feels it can make a positive difference. 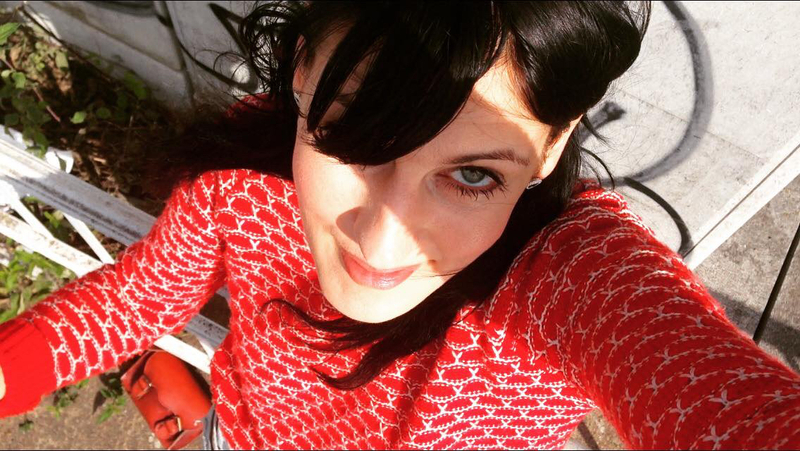 Described as: “a very feminine woman who paints wearing heels and shorts, scraping dirty walls and splashing paint on herself”, Anthea conveys a strong message about empowerment. Arty-Fact: Over the course of life, the best satisfaction comes when you find that one true friend you can trust. That one friend who listens to your sorrows and laughs with your happiness. That friend who makes you feel so understood you feel a complete sense of release. Your true friend is quiet, but can be a grenade. Your true friend will defend you but can also become your worst enemy when betrayed. Knowing how kind and tough your true friend is, and vice versa, respect is the foundation of a friendship that can last forever. Arty-Fact: When I look at Hokusai’s ‘The Great Wave Off Kanagawa’, I imagine his melancholy scene in a more lively and dynamic way. The sea is an animal, deep and wild but also mysterious with an energy that can be so feminine when quiet and still. The waves are a reflection of our feelings and emotions – sometimes out of control, sometimes calm and meditative. Anything can be found in the sea and hidden from its surface: not only the wild leopard with its active and ferocious spirit, but also the radiant and magnetic fragile mermaid. Arty-Fact: Life is like a game full of colours and surprises. You can choose to play any role. Living life in a playful manner is like hide and seek, never losing that connection with our inner child, sparking potential and infinite possibilities. Arty-Fact: Inspired by Botticelli’s ‘Venus’ – a picture of beauty, femininity and fertility – ‘Venus In Bloom’ portrays a slender, athletic figure with a graceful face and her hand on her heart. 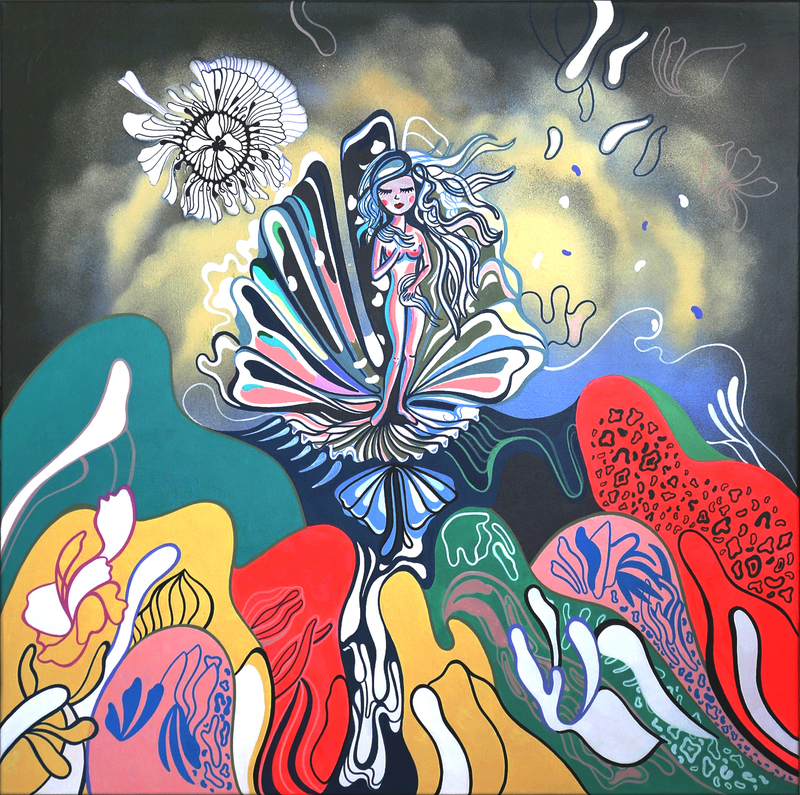 The abstract sea creatures will try and interupt her tranquility by attempting to bump into her. 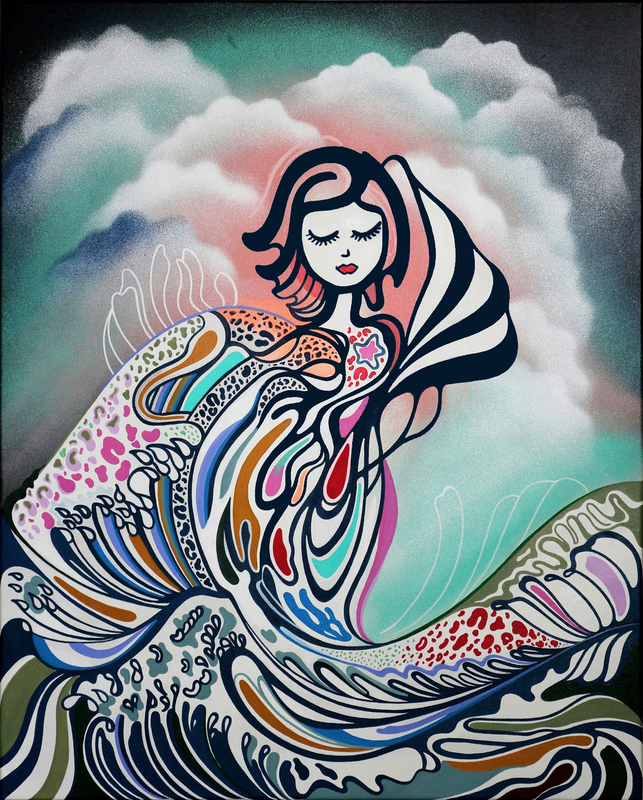 She is swaying with the waves in the middle of the surrounding storm, all the while remaining peaceful. The seeds of her fertility fly above her, representing mental powers of creativity. The image asks us not to fight against the unexpected twists and turns of life but to embrace them and see them as opportunities to become happier and more resilient. Arty-Fact: She has always been told she is wildly innocent and cute, when in fact, things are contrary to what they seem to be. Having met her, people walk away on a high, feeling joyful and upbeat but soon, that intense feeling dissipates, leaving behind a sense of disillusion. 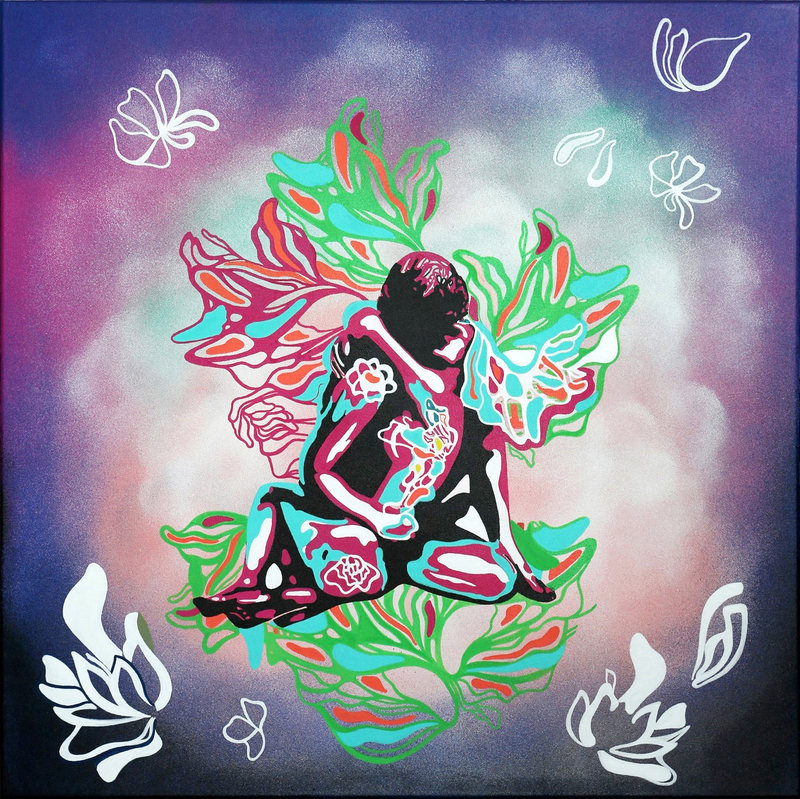 Arty-Fact: Initially painted on a wall in Phnom Penh (2015), this image was called ‘The Lightness of Being’. Two years on, the meaning of this work has evolved and is now a representation of the unbreakable unity of two people who have weathered a storm. This piece is about finding your other half, your partner in life, your team mate and the bond that is forged through love and mutual respect between two people. 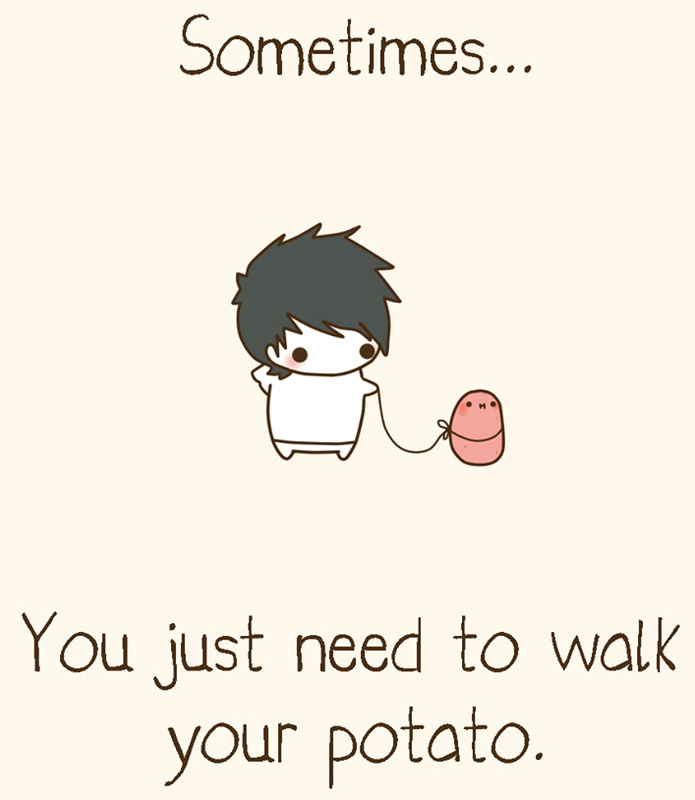 Arty-Fact: We’ll go anywhere together as long as we continue to nuture our dreams. The real moment of happiness shared with someone you love is often not when your dreams come true but the path taken to get there. Sharing life’s highs and lows and sticking together. Reminiscing on all we’ve experienced as a pair – the laughter and the tears, all the unforgettable moments. What would we laugh about when we reconnect to the past if we didn’t have those glorious stories about chasing our dreams together? Those tremendous moments of chase all happening to the cool tunes of Johnny & Mary in the background. Arty-Fact: The moment you feel aligned and in-tune with a person is like a radical embrace. Before bodies touch, minds and hearts must find a deep connection. That’s the moment you feel complete, the moment you have found your other half – two pieces making a whole. A feeling that is eternal – a suspended union in time and space. Emotional Osmosis is inspired by the legendary sculpture ‘Un Homme et Une Femme’ carved by Stephan Abel Sinding. Arty-Fact: That feeling when you are surrounded by nature and see yourself a as tiny speck in the world. When you stop and contemplate the beauty of nature, so quiet you can hear the melody of the plants in the wind. That moment when you’ve walked for hours and a storm is on its way – you can feel the air is electric but you have no place to go to protect yourself. When all that’s left is dancing in the rain and knowing you will celebrate the sun which will shine again soon after.